I started with a piece of cardboard that was 12.5 inches wide x 10 inches tall. 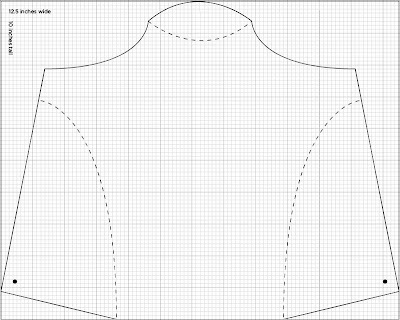 I created this template in illustrator, which you can copy and enlarge to make it the correct size. I cut out the shape. Instead of covering it in fabric, which also works, I covered mine with a sheet of decorative paper. The dotted lines indicate where you need to fold it. Then punch holes in each side at the bottom and tie a string through. This pulls the sides back and enables it to stand upright. Here is the finished product displaying one of my necklaces. I'm so glad I made this because I think it really displays it beautifully and will work great for my necklaces in my etsy shop. Let me know if you have any other ideas or suggestions for displaying necklaces! Wow! That looks great! Thanks for sharing the how-to! My store bought one is hanging on it's last leg of scotch tape and this will be a great and much prettier one to use to display my items as well! wow this turned out so nice ! I tried one like this and it didn't work for me...made a mess :) I am inspired to try again now however ! wow! that is so helpful! I need more displays but just don't have the money, THANK YOU! This is great! Turned out wonderfully! Wow, it looks great! Thanks for sharing! I'm thinking about doing a craft show this holiday season and was actually looking to buy some....now I can make my own!!! You are wonderful! You are very welcome! I thought about that too, these would be an easy and cheap way to do several for a show. Embiggen!!!??? Do you mean enlarge? That's hilarious -- the word "embiggen" was invented for an episode of The Simpsons (to mean enlarge) and has crept its way into being used in real language. Too much! This is very clever! So sharp looking. What a brilliant idea.. I suppose you could use pre printed card as well? Great to find your blog via Etsy.. I am a real newbie there and so looking for lots of advice!! Okay this is AWESOME! Nice work! That looks really great, I like the decorative paper. Yes, it always looks nice on real people, but when you're selling a necklace, some people don't like it to have been worn by someone else and maybe having traces of skin cream or makeup on it. Such a great idea! Brilliant! Very well done! I think I prefer the paper rather than fabric covered route. Will link in a future blog post. I love your design and would like to make my own. What type of cardboard was used? I love this idea! Thank you for posting it. Your jewelry looks beautiful, by the way. It looks awesome. Did you use cardboard in yours? It looks so thin and from the back it is white. I want to try this. Thanks! Hey nice job, hope mine looks as great. Thanks for saving me some money. Thank you for sharing this! I was going to make my own because I really wanted something "cuter" than the boring black velvet ones I swa at the store. My jewelry is unique and now I can create a display that is too! Thanks!! Very pretty display! I'm going to be doing my first craft fair in a couple weeks, this is so handy. Have to give it a try, and see how it turns out. Wow that is cool! I am all for saving money, and it sure would be easy to store! Fantastic template, thank you so much, was just about to order one online then found you ! I am the admin for www.ejewelrysource.com. 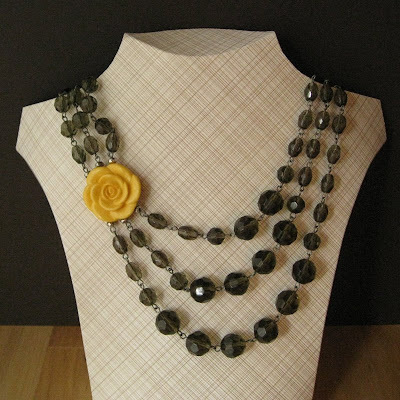 Can we direct our readers to this article so they can learn how to make this necklace display. We will include your name of course. Please let me know. Thank you. Hi. Absolutely feel free to share this posting with your readers. Thank you for asking! I'm glad you all find my tutorial useful! Isn't it a fun, quick and cheap way to make your own necklace displays? The original design is mine (see copyright notification on Rena Klingenbergs website). Ohhh c´mon put some tags menu XD Pleaseeee! Wow what a great idea!! Thanks for sharing that with us! WOW! I've just printed this off as soon as I saw it! I've been planning on making some of these for ages, but didn't have the time to sit down and plan it out. I've already bought some lovely linen effect paper from Wilkos to use on it, but I suppose some pretty statement wallpaper might also work as a covering! Thanks for sharing! I've just finished making TWO of these already! Brilliant idea! I did one the same shape as the template, turned it around to fit landscape on a sheet of A4, the other, I stretched it on the A4 to fit portrait. They both work really well, but I did have to trim about a half inch off the bottom (on the front, not the sides, angle it back to the original edge there) of the taller one because of the extra height, it wouldn't balance quite right. Thanks again to Stella! Will be definitely trying this, thank you so much! The cardboard that comes behind the photos when you have your picture taken at Walmart is exactly the right size to do this. I sewed a piece of black spandex velour, on the wrong side of the fabric, the size and shape of the sides and top of this pattern (from a dress I got at thrift store). I then turned it right side out, stretched the material over the pattern, then glued it. All I had to do then was tuck the bottom up inside the back and glue it. I'm gonna definitely try this out for my jewelry. Thanks for sharing! Wow, Thanks so much for the pattern! This is great, Love it! Thank you! These are great! I show at the NY giftshow and these won't take up any room to transport! merciiiiiiiiiiiiiiii c'est tres tres gentil a vous de partager !!!! Thanks for sharing. Would like to try this out! Although this is a few years late, this is my first time seeing it since I'm working on my first craft show. Research is key and you have made this extraordinary! Gorgeous!! I look forward to making this work for my own display!! So smart and clever! Love it! Thanks for sharing. Really great idea. Thanks for sharing this, I bought a black velvet one but when I take pics there is so much white fuzz on it even after vacuuming it. Will make myself a white one now plus several more for shows. Love your idea. Thanks for sharing. It is very thoughtful. Printed these directly onto white cardstock. They work wonderfully for small necklaces. Didn't even need to add the holes or string. They stand up all on their own. Thanks so much for the idea. Thanks loads I have just tried this for displaying bibs made it a bit taller and it works a treat. esta buenissssimo . !!! muy util y es justo lo que necesitaba , gracias ! I love this idea! Thanks so much for sharing it. I will have to make several of these for my upcoming jewelry show. I really like that this model is 3D and not flat. I find that most of my jewelry does not display as well flat. Thanks again! I just used your template and I have to say Thank You so very very much for sharing it. I used 2 layers of heavy card and covered it with felt. Beautiful!!! I can't wait to give them to my newest daughter for her crafting fairs she makes jewelry. Thank you again. I wonder if this would be sturdy enough for crocheted cowls. I might have to try it and see. I love it!! laperin deals with all kind of rings with sterling silver rings , sterling silver wholesale jewelry , jewelry silver ,jewelry necklaces , sterling silver jewelry , jewelry earrings and also best fashion silver rings. Wow, exactly! Awesome, how did I miss this on the internets? I'm Devon, a designer in love with color, pattern, illustration and all things handmade. This blog is a show & tell of what inspires me, amazing finds, projects I'm working on and my never-ending creative wishlist. Minneapolis Picks features STELLA + HODGE!! NEW custom prints in my shop!